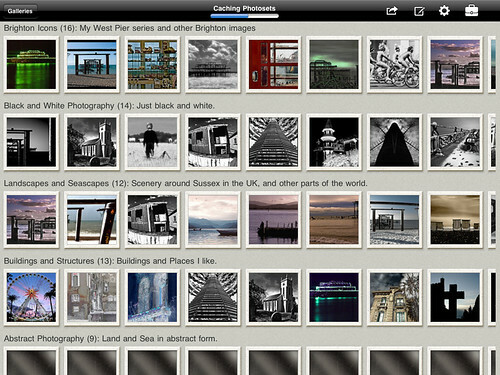 Portfolio To Go is the perfect iPad app for artists and photographers who use Flickr.com to showcase their photographs online. 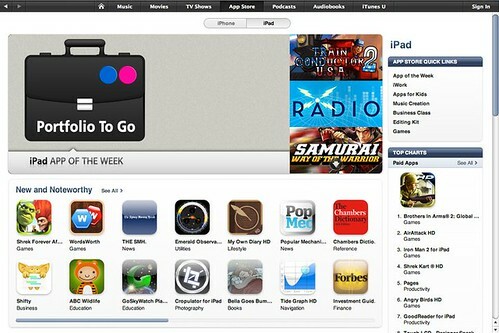 A recent winner of Apple’s ‘iPad App of the Week’ award, Portfolio To Go features an elegant and intuitive photo-wall giving users instant access to all of their Flickr photosets: scroll each gallery horizontally to browse thumbs, scroll vertically to traverse through all synced galleries. The main purpose of Portfolio To Go is to enable photographers to present their portfolio offline to clients – perfect for use with iPad wi-fi: just sync and go. Photographers create and edit photosets on Flickr.com and Portfolio To Go acts as a presentation tool, keeping in sync with all your Flickr changes. 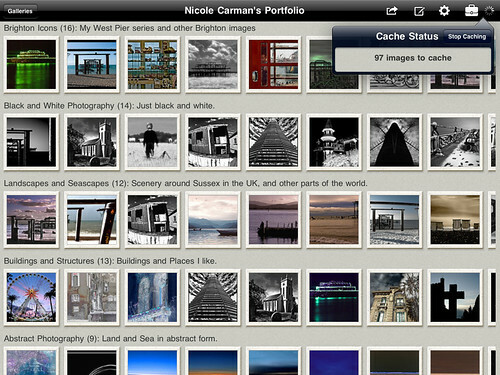 Portfolio To Go supports all iPad rotations so can be flipped vertically for portraits and horizontally for landscapes. Another unique selling point of this app is the ‘Send Portfolio to a Client’ feature. 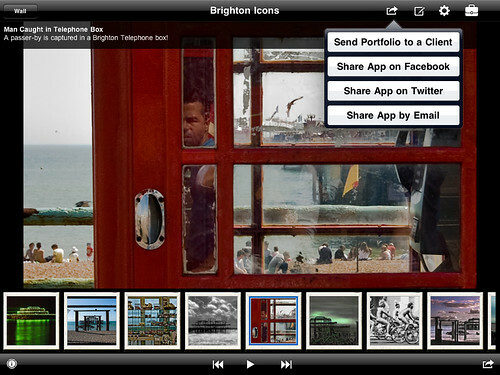 The Photographer picks and chooses which of his galleries to share and can then send an auto-generated email to clients and friends containing a free download link to ‘Portfolio To Go Player’ iPad App. 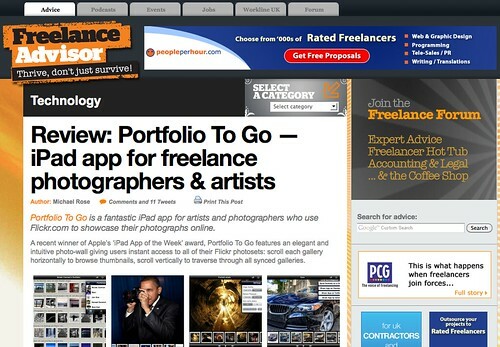 By clicking the emailed link clients launch the photographer’s portfolio on their own iPad(s). View all your Flickr photo galleries at once – scroll each gallery horizontally to browse thumbs, scroll vertically to traverse through all synced galleries. Click on any thumbnail to jump into the main image view. 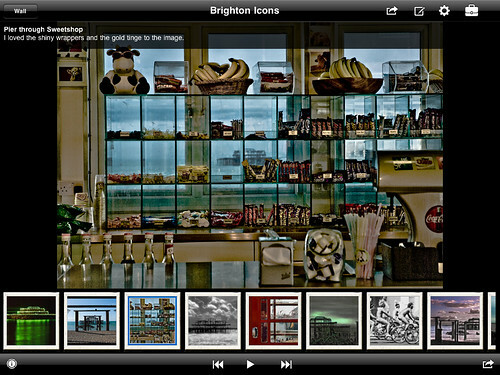 # Main image view displays gallery thumbnails to enable intuitive gallery navigation. Just click the main image to go full-screen. # Multiple cached portfolios: add unlimited Flickr portfolios via your contacts or Flickr IDs to P2G and switch between them. # Send Portfolio to a Client: Pick and choose which galleries to include and then send your portfolio straight to clients and friends by email from the app. Clients will download the free Portfolio to Go Player app to their iPad/iPhone/iPod Touch and launch your portfolio from the emailed link. 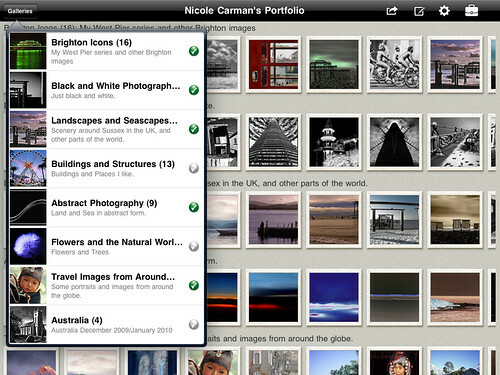 Portfolio To Go for Flickr is elegant and refined. It has the rare quality of presenting my images quickly, cleanly and completely, without distraction. Unlike so many apps whose designs call attention to themselves, this app does a neat disappearing trick — it lets me show my images, and gets out of the way. I’m a pro photographer and this is just what I’ve been looking for. Super application from a developer who deserves 5 stars. This is an excellent Flickr app, with a simple intuitive interface and plenty of options and features to make any Flickr user happy. 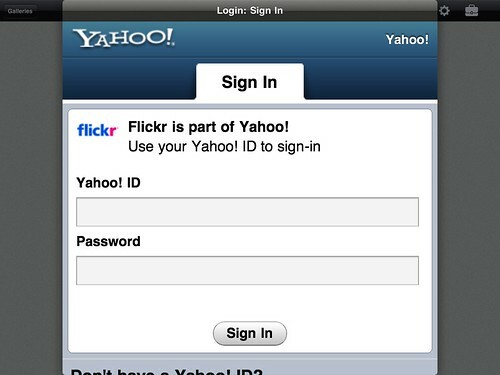 It is so good that I doubt the official flickr app (when it comes out) would be any better than this one. 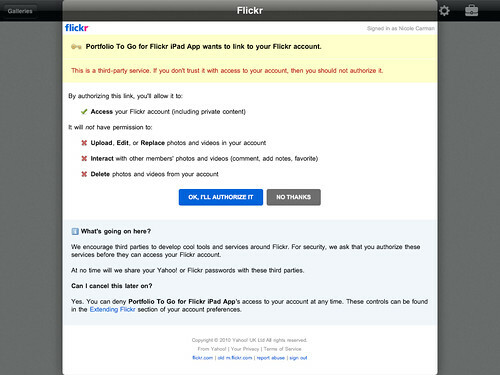 …and then requests access to your Flickr account. It requests read-only access in order to download and cache both your public and private photos and photosets. Step 3: Once your Flickr photosets have been created locally, Portfolio To Go automatically loops through all of your Flickr Photos, downloading and caching each photo in turn. The speed of this process is dependant on the size of your Flickr photos and the quantity but you can check the caching status by pressing the spinning activity indicator. Once this process completes you’ll be able to demo your portfolio offline. Step 4: Each gallery can be scrolled horizontally and the whole photo wall scrolls vertically through your Flickr photosets. 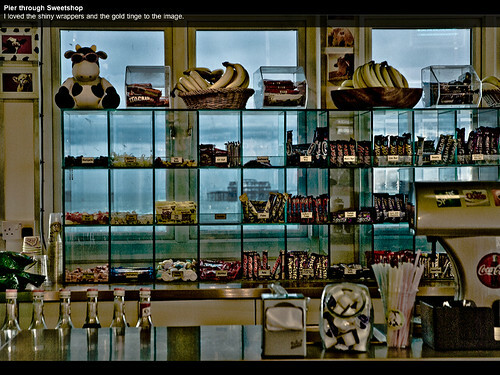 Galleries can be switched on and off via the ‘Galleries’ button on the photo wall. Step 5: Touching any thumbnail will trigger the app to transition from the photo wall into a touch responsive slide-show of the chosen gallery. Tapping the main image in slide-show mode makes the image go full screen. 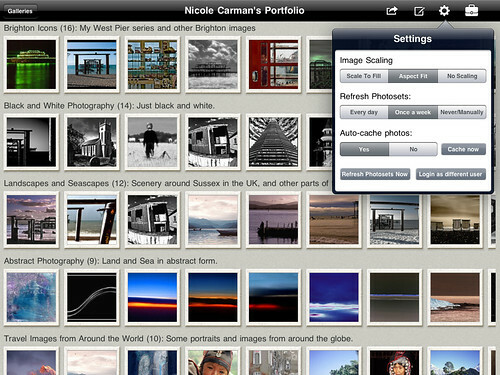 Step 6: Portfolio To Go enables you to send your selected Flickr photosets to clients and friends by email. Before using this feature, first select the galleries you do/don’t wish to share (Step 4) and via the settings popup select the best image scaling option for your photos. Via the action menu you’ll find the first option ‘Send Portfolio to a Client’. ‘Send Portfolio to a Client’ will automatically generate an email with a link to your portfolio. 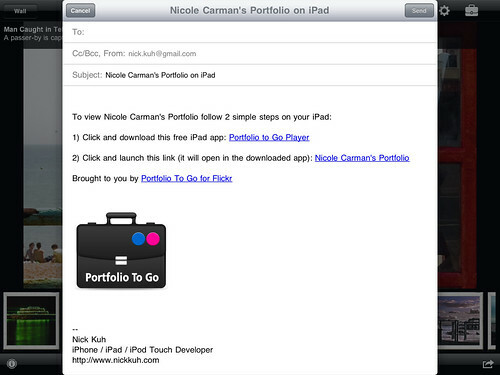 The generated email contains instructions of 2 simple steps for clients and friends to follow to view your portfolio via a free iPad app called ‘Portfolio To Go Player’.